Languages : Tamil, Telugu and English. Temperature : Max. 39°C and Min. 29.5°C in Summer. Max. 27.3°C and Min. 17°C in Winter. Vellore is now pulsating with activities as a commercial, administrative, educational and medical centre. Vellore grew into bustling town gradually since the 6th century changing the rulers and growing in importance. Vellore has the renowned Christian medical College and Hospital where patients from all corners get advanced medical treatment. Air: 140 km from Chennai is the nearest airport. Rail: Katpadi railway station is situated 5 km from Vellore town. Road: Buses are available from Chennai and Bangalore. 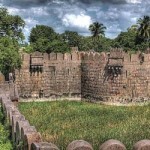 Vellore Fort: Dating back to the 13th century this ancient fort is the main attraction for the tourist. This historical famous fort retains the past glory with its ramparts, basements, turrets, posts, sally gates and with perennial water supply. It is fortified by double wall and the main walls are mode of massive granite blocks laid one over the other without using any mortar. It was describe as the strongest fortress. Muthu Mandapam: This is the memorial built around the tombstone of Vikramraja Singh, the last Kandy Tamil ruler. Situated on the bank of Palar River, it is just 1 km north of Vellore town at a walking distance. Jalagandeeswarar Temple: Temple inside the fort is dedicated to Jalagandeeswarar and is noted for its sculptures, which speaks volumes of the exquisite craftsmanship of the highly skilled artisans of that period. The sculptures in the porch on the left of the entrance are masterpieces appreciated by the connoisseurs. It has a big marriage hall adorned with elegant reliefs and monolithic sculptures. Government Museum: This is a multipurpose museum maintained by the department of museums Government of Tamil Nadu. It treasures ancient and present day curios relating to Anthropology, Art and Archeology, Botany, Geology, Numismatics, Pre-History, Zoology, etc. Historical Monuments of the erstwhile composite North Arcot District are gracefully depicted in the gallery. This museum is kept open on all days between 9 a.m. to 12:30 p.m. and 2 p.m. to 5 p.m. except on holidays. Admission is free. C.M.C. Medical College: If Vellore attracts a floating population of 5,000 every day, it is because of the world famous C.M.C. founded in the early part of the century by a dedicated American Medical Missionary Dr. Idda Scudder. Besides a world famous Cancer Ward and Neurological Ward, it has a Mental Health Hospital and a College of Nursing. Vallimalai: This temple is situated on the top of a small hill, which can be ascended through a flight of 300 steps. The principal deity is Lord Subramania. The temple was build about 1,500 years ago. Most part of the temple looks like a cave of the hill. Mordhana Dam: It is a picnic spot where the dam is constructed between two hills. 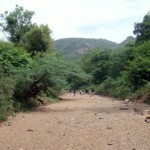 Amirthi Forest: 24 km south of Vellore is the panoramic Amirthi Forest, rich in its variety of flora and fauna. A half of the jungle is cleared to serve as a tourist spot while the other half is developed as a Wildlife Sanctuary. A trek for a km leads one to full view of seasonal waterfalls. Padavedu: Padavedu is situated 35 km from Vellore. Padavedu now a desolate village having two important ancient temples is an interesting place of pilgrimage. There are beautiful carvings depicting the invitation of Parasurama by Shri Renuka Devi. Thiruvallam: Thiruvallam is located 22 km of Vellore on the western bank of the Nuga River, a tributary of Palar River, is famous for ancient Shiva Temple. A note worthy feature of this shrine is that the Nandi is not facing the Lord but facing the east. Javadu Hills: Jamnamaruthur is situated 40 km from Polur is the main village in Javadu hills, which is famous for its sandalwood and fruit bearing trees. It is an altitude of from 300 – 1000 mts. The Beemanmadavu water falls in the thick reserve forest 12 km from here is worth for hard-trek. The night stay here is a new experience due to the solitude of the hill. 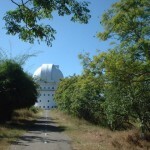 Virinjipuram: Virinjipuram is situated 19 km from Vellore. It is magnificent temple dedicated to Lord Shiva is located on the southern bank of the River Palar. Around the basement and the pillars of the temple are a number of well-executed figures singly and in lively groups in dramatic settings representing scenes in the social life of the people. There are several inscriptions here both in Grantham and Tamil. The Lion-faced Simmakulam tank is considered to be very scared. This entry was posted in Tamil Nadu, Vellore. Bookmark the permalink.